Are you working on sight words? We’re always looking for new, hands-on ways to practice them! This Winter Clothes Pre-Primer Sight Word Match is my daughter’s favorite sight word activity so far. Do your kids love dressing up paper dolls? Here, they can do just that while also practicing their sight words! Printable pdf file (purchase below). 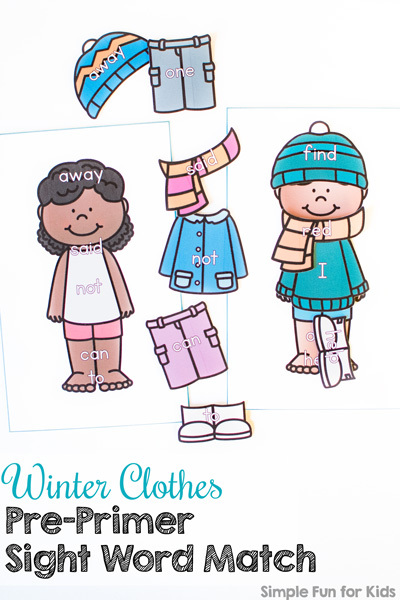 The pdf file contains eight different paper dolls and eight sets of matching winter clothes. Each item of clothing has a pre-primer sight word on it that match sight words on body parts of the paper dolls. There’s one sight word on each head, throat, belly, legs, and feet. All 40 pre-primer sight words are included. To prepare the activity, print out the pages you want to use. Cut out the items of clothing. You can cut out the paper dolls at their outlines if you want, but it’s not needed, just cut along the turquoise lines. That’s all you need to do in preparation. 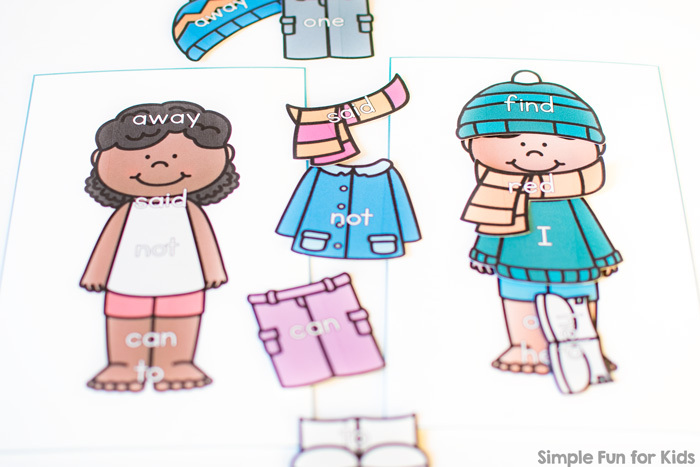 Mix several clothes sets and the matching paper dolls and let your kids match and read the sight words. This activity works great as a kindergarten literacy center, at home on the kitchen table or in a busy bag!